My handbag is usually never without EO’s Everyone Hand Sanitizer Spray, but during the packing process for a trip to DC last week, I had to forgo it to save space for my other beauty booty. I’m getting sick again and am kicking myself for not sacrificing another liquid in my TSA-required plastic baggie to keep my EO Everyone Hand Sanitizer Spray by my side. 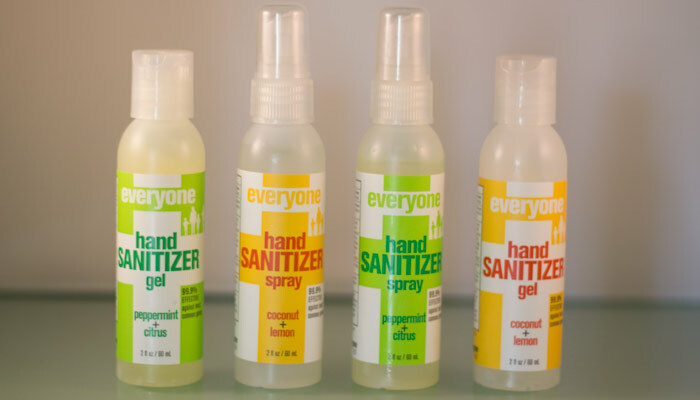 EO’s Everyone Hand Sanitizer Sprays and Gels come in two different scents: Peppermint + Citrus and Coconut + Lemon. I typically reach for the Peppermint + Citrus Spray to get a dose of aromatherapy benefits during the day (peppermint does wonders for me! ), and love the way it blends with citrus notes. Hand sanitizers aren’t typically something I obsess about, but I of course avoid harsh triclosan-loaded sanitizers and prefer a fresh scent over straight alcohol smells. So, as you see above, the gel versions contain dimethicone, which a lot of us avoid in facial skincare because it can clog pores (dimethicone is a silicone that gives products that “slip” for easy application). It’s got a low EWG rating, and ask long as you aren’t sanitizing your face, you should be A-OK. I do prefer the sprays, though, as sometimes the gels can get those weird little nubs of product buildup under my nails (do you know what I’m talking about?). I’ll repurchase the sprays if they are readily available at a my local retailers. There’s so many clean hand sanitizers on the market that it really comes down to accessibility and price if the ingredients match up point by point. Do you have a brand preference when it comes to something like hand sanitizers? Do you even use hand sanitizer? I’d love to know! Tell me in the comments section.